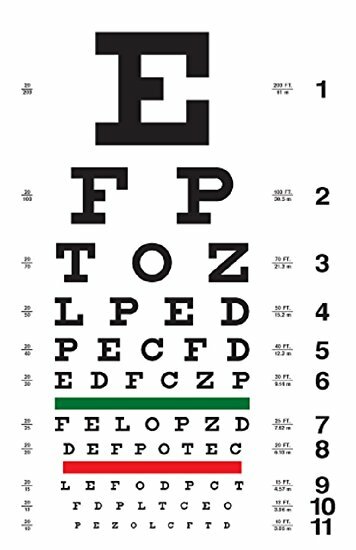 Your Visual Acuity will be assessed using the Snellen Eye Chart (pictured below) which measures how well each eye can see. A detailed history of the quality of your vision will be obtained, including if you are bothered by glare or if you have been experiencing problems seeing in dim light. A refraction will be performed to determine your best level of vision and if your vision can be improved by changing your glasses in lieu of surgery. Drops are put in your eye that help to widen (dilate) the pupils. Then, using a special magnifying lens, your eye doctor will look at your natural lens, which over time becomes yellowed and cloudy – a cataract. Your overall eye health will be assessed as well and a diagnosis will be made. Once it has been determined that you are a good candidate for Cataract Surgery, your questions will be answered and your surgery may be scheduled.